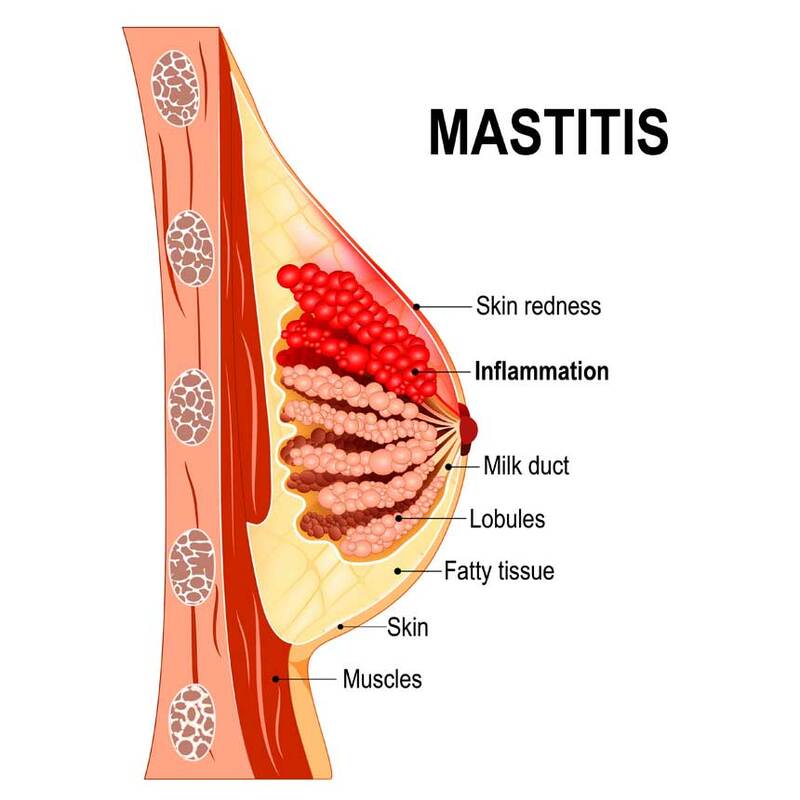 Mastitis is inflammation of the breast while an abscess is an infection leading to a pocket of pus. Breast abscess are usually separated into two categories. Those occurring during breast feeding (lactational) and the remaining (non-lactational). If left untreated the abscess will not go away on its own. It may sometimes drain through the skin with pus and form a tract (fistula), but may also lead to significant spread of infection to the skin around the area leading to significant loss of skin. Infection can also spread to the bloodstream becoming life-threatening. If you smoke, have diabetes, excess weight, take medication which dampened your immune system such as steroids you are more prone to the infection spreading. The common symptoms of mastitis or an abscess are swelling, redness and pain around the affected area. Symptoms of fever or generally feeling unwell indicate that infection may be spreading into your blood stream. A careful history of your symptoms will be taken and you will be examined to confirm the diagnosis and exclude other conditions. Usually the diagnosis should be able to be made through the examination but sometimes additional tests such as blood tests or an ultrasound scan may be required to confirm the diagnosis if the presentation is not typical or a deeper abscess is suspected, to exclude other pathology or to provide treatment. Sometimes at the very early stages antibiotic treatment may be able to treat the mastitis or abscess but this will need careful monitoring. If you are breast feeding you are encouraged to continue breast feeding and expressing milk from that breast as that helps drain the infection and does not affect your baby. An ultrasound may also be performed and the abscess drained through a needle. You may need to undergo these procedures a number of times before the abscess goes away but this spares you the need for surgery. If the abscess is not settling with the above measures or the skin overlying the abscess is compromised then surgery usually under a general anaesthetic is required to surgically cut open and drain (incision and drainage) the abscess. The most appropriate treatment option will be discussed with you at the clinic at an individualised basis.